The vestibular system is the balance system of the body. It is the labyrinth, a part of the inner ear, comprised of the semi-circular canals and the utricle and saccule. This system can detect rotational movements of the head and linear accelerations. It co-ordinates with the eyes to provide us with our balance, spatial orientation and equilibrium. 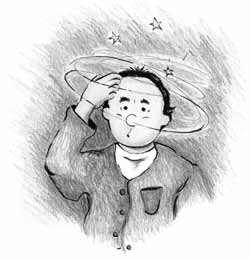 BPPV is a common form of dizziness caused when otoconia or “ear crystals” fall out of the utricle and become displaced into the semi-circular canals. This causes symptoms such as vertigo or dizziness, nausea, light-headedness, balance problems, vestibular neuritis (Labyrinthitis), cervicogenic dizziness, post traumatic vertigo, chronic vestibulopathy and balance disorders. What happens in a vertigo consultation? Assessments are conducted by Physiotherapists and involve a thorough verbal and hands-on component conducted in a private room. The assessment will assess the vestibular system in the ear, neck function, blood pressure and general balance. Other problems that may warrant assessment in conjunction with the onset of vertigo are headaches or neck pain, a recent whiplash, fall or viral illness, jaw joint dysfunction and recent changes in medication. Treatment involves education as well as hands-on treatment such as Epley or Seamont manoeuvres to move the otoconia back into the utricle where they will slowly be reabsorbed. Exercises known as vestibular retraining are carried out to restore balance. Home exercises and positioning will play a key role in treatment. Clients should bring all x-rays of the head and neck to their appointment. Initial appointments are 1 hour in length and the client must be accompanied to the appointment and cannot drive on that day. A vital component of all treatment. Clients are given a folder at the first appointment with educational materials and diaries which are kept in this folder. Exercises and instructions are added as treatment progresses. This becomes a valuable resource after discharge for the self-management of future flares. In-services and education sessions provided to doctors, nurses, allied health providers, clients and the community upon request. Optimal improvement relies on the client being an active participant in the programme. If you are concerned that you may have vertigo please take a quick survey. This survey has been designed to assess the nature of your vertigo or dizziness and determine treatable elements of your vertigo, thus assisting you to develop a management plan. The screening survey will take 5 minutes to complete and your answers will be confidential. Fill out this survey online click send appointment request and it will be email directly to Rathmines Physiotherapy.